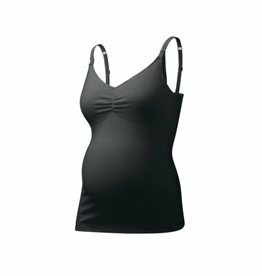 The Elegant Embrace Nursing Bra is a beautifully addition to any pregnant or nursing mom's undergarment wardrobe. The bra combines lace on the outside with cotton softness on the inside. Proprietary Dynatex™ fabric combines the soft, breathability of cotton against the skin, with the luxury of lace, all in one. Lovely floral lace is flat, making it perfect to wear under the lightest of fabrics. Seamless and wire-free for the ultimate comfort. Natural cup shape and low V-neck styling make wearing any top and neckline easy. Fits up to 38 F/G.